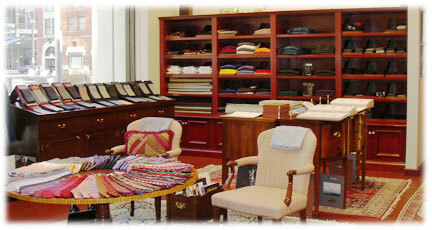 Welcome to Joseph Scafidi Inc., custom tailors and shirtmakers. Here in our club-like shop we assist customers in choosing the perfect wardrobe items from among the finest fabrics and furnishings available for men. Each garment from Joseph Scafidi Inc. is custom-made to individual measurements and painstakingly fitted until even the most rigorous sense of style is satisfied. Of course, since our garments are custom-made for each client, we cannot offer items for purchase on-line. But we invite you to browse this site and to visit us in our shop in downtown Cleveland. If you are unable to come to our store, one of our master tailors would be happy to attend to you at your home or office. From time to time, we, at Joseph Scafidi, Inc. have a particular event that deserves mention here. Especially at the beginning of each season, we have particular fabrics or seasonal items that we are featuring. Please browse through this page to find out about our current offerings.